The U.S. Naval Sea Cadet Corps provides compelling, life-changing programs that instill the values of teamwork, discipline, camaraderie and service through our passionate all-volunteer force and our partnerships with our nation's armed forces. The USNSCC is the officially supported youth program of both the U.S. Navy and the U.S. Coast Guard! We offer our cadets the opportunity to wear the U.S. Navy's uniform and participate in unique and truly outstanding training opportunities aboard military ships and shore stations. As a Sea Cadet, you will interact with many of the 13,500 other cadets across our more than 397 units in the U.S. and territories. Character matters to us. Sea Cadets are mature, driven, and talented future leaders who make good life decisions and hold themselves to a high standard of integrity. If that describes you, you will fit in here with other teenagers who share your life goals, your interests, and most importantly, your values. The Massachusetts Bay Division is a unit of the U.S. Naval Sea Cadet Corps located in downtown Boston, Massachusetts. The Massachusetts Bay Division was started in 2007 at the U.S. Coast Guard base in downtown Boston. Since then, we have mentored hundreds of young men and women as they develop their leadership skills and prepare for college and life. Our unit is staffed by highly qualified volunteers, many with military and law enforcement experience, and we encourage our cadets to succeed. 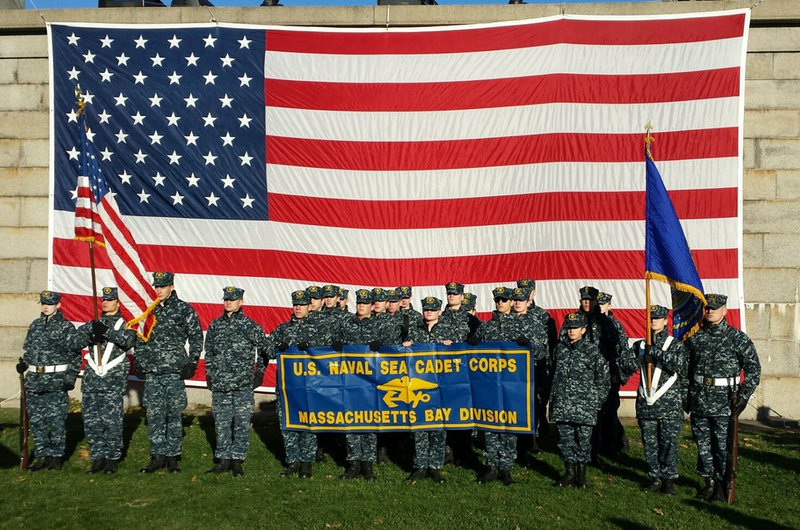 The Massachusetts Bay Division Color Guard is available for ceremonial events upon request. Click here to submit a request. Find out what makes the NSCC such an awesome program! If you live in the Boston area and are between the ages of 13 and 17, be sure to review our membership eligibility requirements! What makes our program so great? Hear it from the alumni of Massachusetts Bay Division who -- thanks to their leadership and military training here -- are doing amazing things out there in the real world!